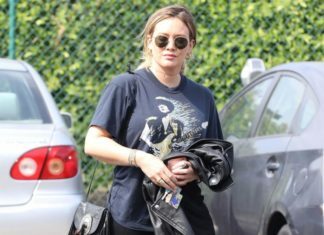 Hilary Duff was out in Los Angeles, enjoying a day with her family. 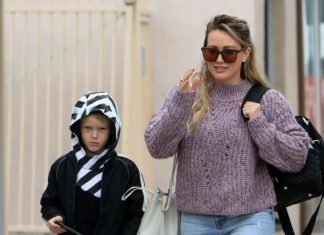 She wore a pair of Adaptation jeans which she teamed with a baggy lilac wool sweater and pink Golden Goose sneakers. 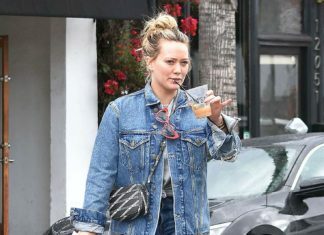 Hilary Duff was a sight for our sore (winter) eyes in an all light-blue outfit, spotted out in Studio City, Los Angeles. 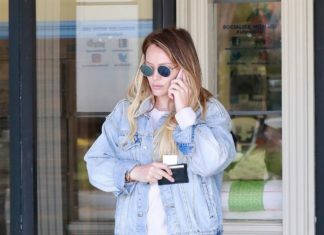 Hilary wore a pair of light blue wash kick-flare jeans featuring an unfinished frayed hem.